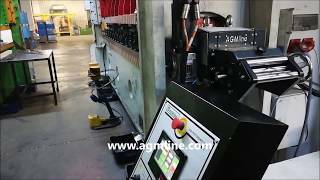 Mini Servo Feeder is designed by AGMline R&D team first time in the World. Design is developed to save energy, work area and maintenance costs. Mini Servo Feeder Model is called as RMF Model also. 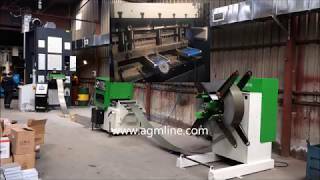 AGMline Produces has mass production of RMF machines with technological production technics. Machine bodies are stress relieved and manufactured according to CE Norms. 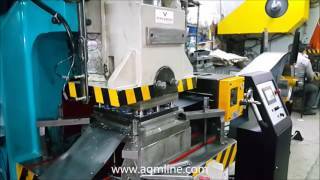 RMF Model machinery has working capacity of 0.2 – 2 mm thickness and 100 – 600 mm width. Since RMF Model is attached to Press Body, Design of RMF Model minimizes guiding need between servo rollers and mold. High Precision Feeding provides long life time for the progressive molds. Moreover, accurate piloting control enable ideal work with progressive and deep drawing molds. All Servo Feeder Models has a control panel with 7” colorful ergonomic LCD touch panel, HMI. 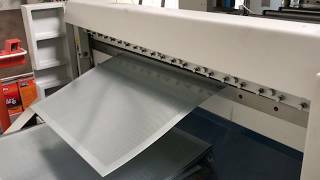 HMI Panel and its Software provide synchronization work of Press and Press Feeding Line in full automatic mode. Also, software and PLC provides up to 8 external outputs and inputs for Lubrication System, Multiple Press Control, and Mold Piston Control. Software is equipped with 250 different mold memories and 50 different feeding length memories. Moreover, software is open ended which enables programming and usage updates in case of customer’s request.